Standing with his legs in a unusual, buckled position, the dwarapala holds a small shield in his right hand and a cudgel in his left hand. The broken cudgel is perhaps the only feature of the statue which is seriously damaged. While it is customary for dwarapalas to have a rather fierce countenance, this once has a pleasant, smiling expression. The difference with the better-known Javanese dwarapalas doesn’t end there either. This specimen doesn’t have the protruding fangs which are such a feature of his Javanese cousins. Nor does he have the bulging eyes, which served to make the faces of your typical dwarapala all that more gruesome. Finally, while the dwarapalas from East Java are guaranteed to have skulls for ear-rings, this example has a blossom for an ear-ring. Overall, the monstrous elements of this figure have been played down, giving the statue a more kindly and welcoming aspect. In fact, the statue is so different from all other dwarapalas that it remains a bit of a mystery. 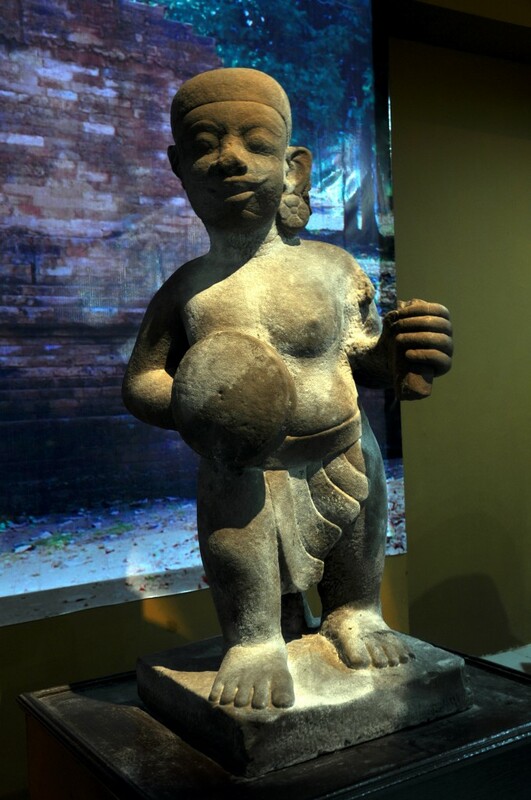 Some commentators have noted that it bears some resemblance to figures from megalithic cultures elsewhere in Southern Sumatra, such as the Pasemah Plateau and Lampung. Perhaps this statue bears some trace of the megalithic cultures which inhabited the hinterland of the Malayu kingdom. Others have noted that the way the cloth exposes the back and thighs of the statue is similar to clothing worn by the worker and slave class. This is interesting enough in itself, but it leaves us with the question of why this statue alone would have used a slave as a model for a temple guardian. The discovery of this unusual statue has raised some interesting possibilities and prompted some spirited conjecture, but for the time being it remains something of an enigma. There are four Singosari temples which have survived to the present day (five if you count Candi Jawi, which was built as a monument to the final Singosari king, King Kertanegara, in the years immediately after the downfall of his kingdom). For the typical traveller, the one most worth seeing is probably Candi Singosari, as it is the tallest and grandest of the surviving shrines. Apart from that, it is also the temple which bears the name of the entire kingdom, which gives it a sense of added significance. A further point in its favour is that it is located just off the main road between Malang and Surabaya, which makes it very easy to visit, even without your own car. Situated just 12 kilometres down Malang, you can get out here in half an hour on any of the innumerable bemos trundling downhill towards Pasuruan. What you will find is one of the most satisfying historic sites in the province of East Java. Archaeologists tell us that the keraton (palace) of the Singosari kingdom was once located in the vicinity, and a major ancient settlement spread out around it. In its heyday this area would have been home to at least 8 temples and an alun-alun (town square) as well as the gateways, courtyards and pavilions of the Singosari keraton itself. This was the nerve centre of a kingdom that had vassals as far away as Kalimantan and the Malukus (Spice Islands), and at its peak it had even caught the attention of Kublai Khan, the ruler of the Yuan Dynasty in China. Yet all that remains of this royal complex today is Candi Singosari and a couple of giant dwarapala (dwarf-guardian) statues. Nonetheless, this sense of vanished grandeur is one of the things which makes Candi Singosari a compelling attraction; it evokes thoughts of all the treasures that have been lost. Unlike Candi Jago which is set on a poky, wedge-shaped piece of land in the middle of town, Candi Singosari is located in a large, well-maintained park, with wide lawns, manicured borders of flowering plants and tall palm-trees, which add a bit of tropical flair. There are even some fruit trees growing here. The ample grounds allow you to view the monument from all sides, which makes it easier to take a variety of photographs. It also makes Candi Singosari a relaxing place to linger in while reading up on the history of the Singosari dynasty. For those who have viewed the other Singosari temples first, the size of Candi Singosari will come as a bit of a surprise. Though with a height of 15 metres, it is only 3 metres taller than Candi Kidal, this temple has a much more massive look. It is set on a square platform of volcanic stone measuring 14 by 14 metres, which gives the entire monument a sense of solidity and weight. There are also porches or entrance gates at each compass point and these structures add to the complexity of the structure. Of course all Hindu temples in Java are intended as a representation of Mount Meru, the cosmic mountain of Hindu mythology, but the simpler and more diminutive shrines do not always appear very-mountain like. In contrast, this tower of grey andesite does resemble a man-made peak. In terms of ornamentation, the temple is somewhat less satisfying. The temple was never completed; only the carving of the uppermost parts of the structure had been finished at the time the project was abandoned. That means the ‘tower’ is more ornate than the body of the temple; the elaborate roof turns up at the corners and kala (demon) masks leer down from above recesses on each side. On the lower level, the only decoration to speak of are large, rounded kala heads above the doors. Compared to the detailed carving on both Candi Kidal and Candi Jago, this shrine feels quite unadorned. But if the carving on the temple itself was never completed, Candi Singosari had once boasted a wealth of religious art in the form of free-standing statues. Unlike most ancient temples in Indonesia, Candi Singosari had retained a large number of its original sculptures from the past into the colonial era. Unfortunately, many of these were relocated during the 19th century. In 1893 alone, two Nandis, a Durga, five Ganeshas, a Surya, an elephant, a yoni, and a monster head (kala) found their way to Jakarta (then Batavia). More controversially, a number of them found their way to Leiden in The Netherlands, where they became the centrepiece of the Asian art collection in the Tropical Institute. These include some of the greatest masterpieces of all Indonesian sculpture. Fortunately, there remain a few traces of statuary at the site to at least hint at its original richness. In the main cell of the temple, there is a stone yoni, which is a reminder of the Hindu aspect of Singosari’s complex religious identity. More unusual than this is a statue of Shiva in one of the side chambers. In this manifestation, he is all but indistinguishable from Agastya, who was another popular figure during this era. With his long beard and exposed pot belly, the statue offers a rather homely view of the deity. Perhaps even more appealing are the beautiful, long-stemmed lotus blossoms which are depicted alongside him. 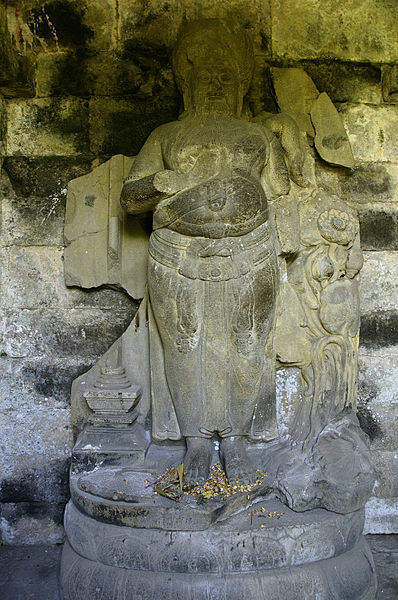 This image of Shiva and the lotus blossoms has been widely copied and borrowed in East Java. Yet lovely as it is, it pales in comparison to some of what has been shipped overseas. We were left wondering if the pillaged Singosari sculptures would ever find their way back to East Java, helping to lift the profile of this little-visited but intriguing Singosari temples.